If you are wondering just what the health benefits of juicing are, come and visit our Health Benefits of Juicing page and find out just how fabulous vegetable and fruit is for you. 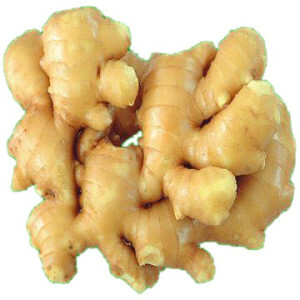 The Jerusalem artichoke makes a useful juice for diabetics as it is loaded with natural inulin (not insulin), an energy source similar to sugar. A small, gnarled tuberous vegetable, it is an excellent source of non-starchy carbohydrates and it is said to reduce a craving for sweets. It is a very good source of potassium. 50 g/2 oz of Jerusalem artichoke juice to 175-225 g/ 6-8 oz of other vegetable juices, such as carrot, makes a palatable drink. A good provider of vitamins A, C and E and folic acid, and the minerals potassium, magnesium and iron. The therapeutic properties of the juice exert a rapid effect upon the kidneys, acting as a good diuretic (you can also save asparagus cooking water for this purpose). It is a purifier of the blood, tones up the nervous system and has gentle laxative properties. Asparagus juice is usually taken three times a day in sherry-glass sized quantities, or mixed with carrot or celery juice. Acne, anaemia, asthma, cancer, eye disorders, gout, kidney disorders, liver disorders, muscular disorders, nervous disorders, prostate disorders, rheumatism, skin disorders, varicose veins. A good source of vitamin A, present as its precursor beta-carotene, and a moderate source of vitamin C, iron, fibre and folate. 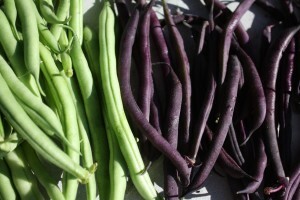 Beans also contain substances that inhibit the formation of tumours. Juice the stem, peel, leaves and seeds for ultimate nutrition. Mix half-and-half with carrot juice. Anaemia, diabetes, fatigue, gout, hypoglycaemia, liver disorders, rheumatism, skin disorders. Lentils, aduki and mung beans make excellent sources of protein, and their juices mix well with other juices. They are an excellent source of vitamin C and iron. Avoid buying beansprouts that feel limp as they are not fresh. Anaemia, arthritis, diabetes, digestive weakness, fatigue, fluid retention, muscular problems, weight loss. Beetroot and their dark green tops are very powerful cleansers and builders of the blood. The green shoots have a high quantity of chlorophyll and more iron than is found in spinach, and the whole vegetable is a good source of vitamins A (as beta-carotene), C and B6. 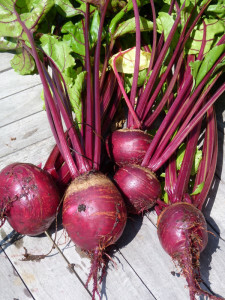 Beetroot is a rich source of calcium, potassium, choline, folate, organic sodium and natural sugars. After carrot, beetroot juice is one of the chief juices in the science of natural healing and is much used in convalescence on the continent. The juice is potent and powerful, so use moderately. 50 g/2 oz of beetroot juice (from approximately ii beetroot) mixed with 175 g/6 oz of apple, carrot or cucumber juice is ample. Broccoli belongs to the cabbage family, and it is one of the vegetables that doctors now recommend as cancer fighters. A chemical, called sulforaphane, has been identified by Professor Paul Talalay and his colleagues at the Johns Hopkins University, USA, that has very definite anti-cancer properties, and this now makes broccoli a superstar vegetable. A good source of fibre, calcium and iron, with an abundance of vitamins A, C and E, and so an excellent food for vegetarians. Juice it and mix with other vegetables, or stir-fry it. Anxiety, cancer, circulatory weakness, cystitis, depression, fatigue, joint problems, motion sickness, nausea, stress, thrush. Another member of the cabbage family that is an excellent source of vitamin C. It is a moderate source of fibre, phosphorus, iron and vitamin A (as beta-carotene). A combination of Brussels sprout, carrot and lettuce juice is said to improve the insulin-producing capacity of the pancreas, which should bring cheer to diabetics. 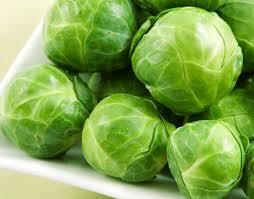 Cabbage, a member of the Brassica genus, is related to broccoli, Brussels sprouts, cauliflower, kale and kohlrabi. It is an excellent source of vitamin C, a good source of folate, and a moderate source of vitamin A (as beta-carotene). The outer leaves may contain 50 times as much beta-carotene as the inner white ones. 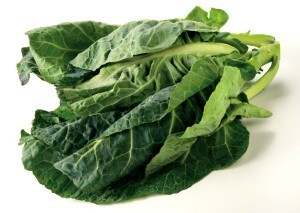 Raw cabbage has a high level of vitamin C and folate, which makes it very beneficial in a juicing programme. It is said to be very good for stomach ulcers. Mix it with other vegetables, especially carrot. Asthma, bladder disorders, blood pressure disorders, bronchitis, circulatory weakness, colitis, constipation, fatigue, fever, hair loss, halitosis, kidney problems, mouth ulcers, pyorrhoea, skin disorders, stress, ulcers. Carrot juice is very often referred to as `the king of the vegetable juices’. It is very versatile; it can be mixed with all other vegetable juices, adding a sweet flavour, and it blends very well with apple juice. In fact, I juice three or four carrots and an apple every day as part of my juicing routine. Carrots have by far the highest beta-carotene level of any vegetable and beta-carotene is converted by the body into vitamin A Older, more mature carrots have the highest level of beta-carotene. In addition to their abundance of beta-carotene, carrots are a moderate source of vitamin C (though cooking greatly reduces the content), and contain some vitamins B, E and K, as well as the minerals calcium, phosphorus, potassium, sodium and other trace minerals. 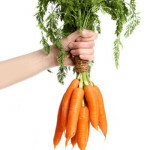 Eyes, skin, hair and nails all benefit from carrot juice. If you drink over 1.2 litres/2 pts/5 cups a day your skin can take on an orange glow, which does you no harm and will disappear as soon as you decrease your intake. Carrots have a tonic and cleansing effect on the liver, releasing stale bile and excess fats, and they therefore reduce cholesterol levels. There are said to be 300 varieties of carrots in the world, with varying degrees of sweetness. The American Californian carrot yields 350 g/12 oz/1 cups of sugar from 1 litre/1% pts/4% cups of carrots juiced, and the English carrot yields only about 75 g/3 oz/% cup, so you should expect variations in the amount of juice yielded by the carrots you buy. If picked straight from the garden, try and juice as much stem as possible as this part is loaded with vitamin K.
Acne, anxiety, arthritis, asthma, bladder problems, bone problems, cancer, cataracts, circulatory weakness, cystitis, depression, diabetes, diarrhoea, digestive weakness, eczema, eye disorders, gout, haemorrhoids, halitosis, hangover, kidney disorders, laryngitis, liver disorders, menopause, mouth ulcers, muscular weakness, nervous disorders, prostate disorders, rheumatism, sinusitis, skin disorders, stress, thrush, ulcers, varicose veins, weight loss. Cauliflower is available all year round. It is an excellent source of vitamin C and folate and provides a good source of potassium and phosphorous. It is best combined with carrot or apple juice, which makes it easier to digest. The outer leaves should be springy, never limp, for juicing. 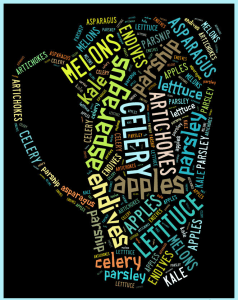 The organic sodium (salt) in celery makes this juice an excellent component of any vegetable combination. It has a calming effect on nervous conditions and is good for weight-reducing diets. The greener the stalks, the more nutritious they are. Beta-carotene is found in the green leaves, while vitamins C and E and the B-complex are in the stalks, which also contain calcium, potassium, sulphur, magnesium, iron and sodium. It is said that the sodium—potassium balance helps alleviate muscle cramping and fatigue. The combination of celery juice and apple juice is believed to relieve insomnia and to cleanse the body of excessive carbon dioxide, especially in polluted areas. A rich source of vitamin C and, like cucumber, a refreshing thirst-quencher. It also acts as an internal body brush, cleansing the whole system. It’s excellent mixed with carrot and garlic. Cucumbers are natural coolants. The juice is good for the complexion and may promote hair and fingernail growth and even prevent hair loss. 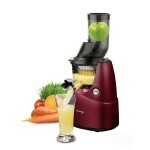 The juice has an acceptable but unusual taste so always blend a small quantity, about 25-50 g/1-2 oz, with carrot juice. Cucumbers contain a great deal of water, and they help regulate the body temperature and are a natural diuretic. Vitamin A lies in the skin, but peel and discard the skin if waxed. Acne, arthritis, bladder disorders, circulatory weakness, constipation, eczema, fatigue, fever, fluid retention, hair loss, halitosis, hangover, high blood pressure, kidney disorders, laryngitis, prostate disorders, rheumatism, scaly skin disorders (psoriasis), weight loss. 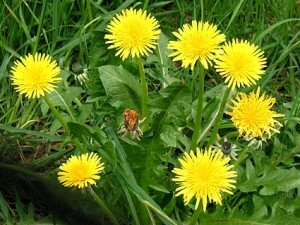 Dandelions have long been renowned as a herbal medicine with diuretic properties. 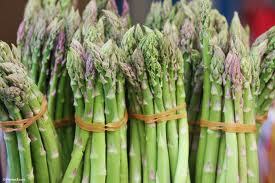 They are exceptionally high in vitamins A and Bl, in minerals and important trace elements. Along with the juices of the stinging nettle and watercress, dandelion juice is used for a bodily ‘spring clean’. The treatment regulates the functioning of the liver and gall bladder and has a beneficial effect on the nervous system. It is also said to give firmness to the teeth and gums and prevent tooth decay. Like carrot juice it is said to improve eyesight and prevent night blindness. The juice tastes slightly bitter so use only 50 g/2 oz at a time, blended with sweeter-tasting juices such as carrot or apple. A salad leaf vegetable in a rosette of green curly leaves. 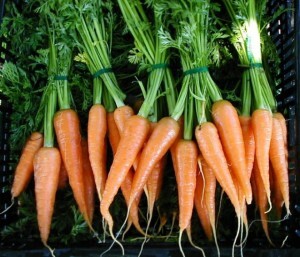 It has a food element constantly needed by the optic system and, combined with carrot, celery and parsley, it refurnishes the optic nerve and muscular system and is one of the richest sources of vitamin A among green vegetables. 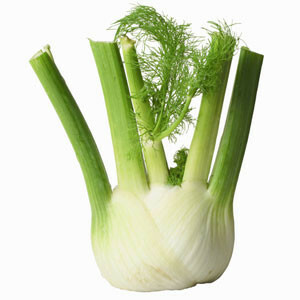 Fennel is a versatile vegetable and the bulb and leaves have a liquorice flavour. 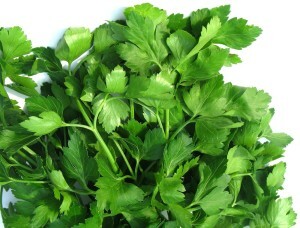 A relative of celery, it contains an essential oil soothing to an irritated stomach. 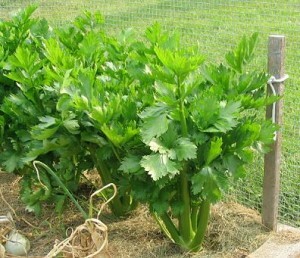 It is similar to celery in nutrients, but lower in sodium, and high in energy-giving sugars. The juice is especially helpful in relaxing and calming the nerves. Mix the juice with other green sprouts and vegetable juices, which will give it a pleasant flavour and aroma. It’s also delicious mixed with apple juice. Arthritis, bronchitis, gout, headache and migraine, kidney disorders, liver disorders, menstrual problems, nervous disorders, skin disorders, weight loss. A leguminous plant related to clover, grown in classical times for the medicinal properties of its seeds. The sprouted leaves are used as a salad vegetable, or cooked like spinach. It has pleasant, slightly bitter taste. Mix with apple or carrot juice. Fluid retention, heart problems, skin disorders, weight loss. 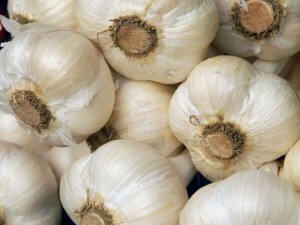 Garlic is a powerful healer and an important anti-oxidant. Evidence has suggested that garlic reduces blood pressure, lowers the incidence of blood clotting, prevents stomach cancer and boosts the immune system. The component in garlic called allicun, which gives it the smell, is thought likely to inhibit bacterial growth and destroy fungi and yeast in the body and rid the body of toxins through the skin. Garlic is high in potassium, iron, iodine and phosphorus. To prevent odours lingering in the machine, juice one or two cloves first, followed by carrots, a little parsley, celery, beetroot (red beet) or apples. Alternatively, crush them separately and add to the juiced vegetables. Horseradish contains an efficient solvent of mucus or phlegm in the system. The ground root, which has a sharp, burning flavour, must be taken in quantities of not more than 2.5 ml/3 tsp at a time because, while it stimulates the appetite and aids in the secretion of digestive juices, large amounts can irritate the kidneys and bladder. Diabetes, fatigue, hypoglycaemia, weight loss. A member of the cabbage family with an exceptionally high calcium, chlorophyll and vitamins A (beta-carotene) C and E content and they are packed with blood-building iron. The juice is especially beneficial to the eyesight, bones, teeth, blood and lymph glands, which swell if they are calcium deficient. It has a strong taste, so is best blended with other vegetable juices or apple juice. Anaemia, anxiety, arthritis, asthma, cancer, circulatory weakness, cystitis, depression, diabetes, eye disorders, fatigue, hair loss, hangover, hay fever, impotence, liver disorders, motion sickness, muscular problems, nausea, pregnancy and childbirth, pyorrhoea, skin disorders, stress, thrush, ulcers, weight loss. Kohlrabi resembles a turnip, except that it grows above ground so it is a swollen stem not a root. 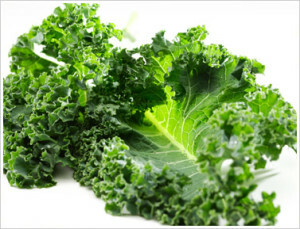 It is an excellent source of vitamin C, carbohydrates and chlorophyll and minerals such as calcium, potassium and iron. Mix it with other green juices. Asthma, catarrh, eczema, lung disorders, sinus disorders, skin disorders, thyroid disorders, weight loss. The Egyptians, Greeks and Romans prized leeks for their medicinal value. They have much the same healing properties as onions and garlic and act as an internal antiseptic. They are an excellent source of vitamins A and C, iron and most minerals. Arthritis, constipation, joint disorders, respiratory disorders, urinary tract disorders. 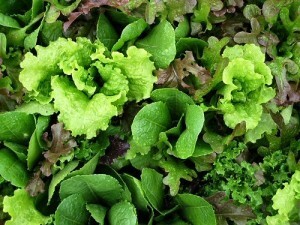 There are many and various types of lettuce. The deep green lettuce is an excellent source of calcium, chlorophyll, iron, magnesium, potassium, silicon, and vitamins A and E and some C. Lettuce juice adds shine, thickness and health to the hair and improves the skin. The iceberg lettuce is said to calm the nerves and relax the muscles. Mix the juice with other green, sprout and vegetable juices. There are many types of melon — honeydew, casaba, charentais, ogen, santa claus, Spanish, cantaloupe and watermelon, to name but a few.’ They are all rich in vitamins A and C and the B-complex vitamins, which makes them good skin and nerve food. They all have a variety of minerals, enzymes and plenty of natural unconcentrated sugar. They are cooling and have a tonic effect on digestion. Juice the entire melon and always eat or drink it by itself. Anxiety, arthritis, bladder disorders, constipation, cramps, cystitis, fluid retention, headache and migraine, kidney disorders, mouth ulcers, prostate disorders, skin disorders, stress, varicose veins, weight loss. 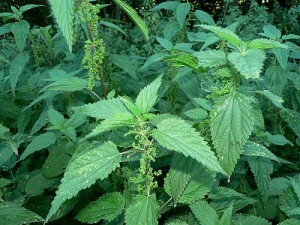 Nettle juice has been used for centuries in natural healing. The herbalist Thomas Culpeper said `the juice is a safe and sure medicine to open the pipes and passages of the lungs’. Nettles are rich in minerals, especially iron, and in folk medicine they are strongly recommended for their tonic and blood purifying powers. In small amounts nettle juice is thought to be useful in healing hemorrhoids (piles). Use only the first five leaves of young nettles in the spring – the autumn leaves are unwholesome. The treatment for hemorrhoids is 15 m1/1 tbsp nettle juice three times a day. Dilute with carrot juice to make it more palatable. Anaemia, bladder disorders, bleeding gums, eczema, haemorrhoids, kidney disorders, nervous disorders. Along with garlic, the onion enjoys a high reputation for its curative properties. The Greeks and Romans used the juice for all digestive problems and as a blood purifier. Onions are a good source of vitamin C and contain more sugar than many other vegetables. They are rich in copper and iron as well as sulphur, calcium, phosphorus, potassium and iodine. The juice is strong, so mix it in small amounts with other vegetable juices. A leading organic remedy, parsley is valued for its high content of chlorophyll, vitamins A, C and E, and minerals such as calcium, magnesium, phosphorus, potassium, sodium, sulphur and, especially, iron. It is a fine blood and body cleanser, particularly of the kidneys, liver and urinary tract. It is an aid to good eyesight. The juice is very concentrated so must be mixed with other vegetable juices or apple juice. 25 g/1 oz mixed with 200 g/7 oz of another juice is recommended. Anaemia, anxiety, arthritis, asthma, bladder disorders, cancer, circulatory weakness, cystitis, depression, diabetes, diarrhoea, eye disorders, fatigue, gout, headache and migraine, heart disease, kidney disorders, liver disorders, menopause, prostate disorders, skin disorders, stress, thrush, urinary tract infection, weight loss. The Elizabethans used parsnips as a sweetmeat with honey and spices, as well as serving it as a root vegetable. Parsnips are sweeter than carrots; three-quarters of the sugar in parsnips is in the form of sucrose which, when consumed in its natural form, is not damaging to the health. Parsnips are a good source of vitamin C, some E, chlorine, phosphorous, potassium, silicon and sulphur, so they are good for the nutrition of the skin, hair and nails. Parsnip juice has a strong flavour, so it should be diluted with other vegetable juices or apple juice. Acne, arthritis, asthma, bladder disorders, bone problems, cancer, cataract, diabetes, digestive weakness, eye disorders, hay fever, liver disorders, muscular weakness, pregnancy and childbirth, sinusitis, skin disorders, ulcers, weight loss. 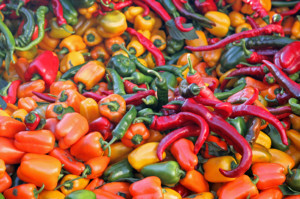 The difference between sweet green and sweet red peppers is age – the red pepper is simply a ripe green pepper. Fruits and vegetables with shiny skins are high in potassium and silicon: these nutrients certainly give the skin a healthy glow, and all varieties are beneficial to the hair and nails. They are a good source of vitamin C and a fully ripe red pepper is rich in vitamin A (beta-carotene). They also stimulate the circulation and tone and cleanse the arteries and heart muscles. Dilute with other vegetable juices. In winter the potato is one of the most useful sources of vitamin C, though this content is reduced by 25 per cent when potatoes are cooked in their skins and by 50 per cent when peeled and diced. The peel is loaded with potassium, which is recommended for high blood pressure. In addition to vitamin C and potassium, they also contain vitamins A and B, sodium, calcium, magnesium, phosphorus, iron, manganese, copper and sulphur. Potato juice is very soothing on the digestive tract, so it is useful for gastric ulcers and arthritis. It relieves constipation and helps hemorrhoids. Used externally it is well known for cleansing skin blemishes. Choose potatoes with eyes, which indicates that they are capable of sprouting, as they will be full of enzymes, and avoid potatoes with green-tinted skins. Raw potato juice is unpalatable and must be sweetened with honey or diluted with carrot, lemon or apple juice. Or it can be added to soups made by the juicer as a thickening agent instead of flour (only X of a peeled potato is needed to thicken 600 ml/1 pt/23f cups of soup). Arthritis, circulatory weakness, constipation, digestive disorders, eczema, fatigue, haemorrhoids, muscular problems, peptic ulcers, varicose veins. 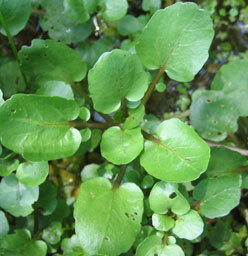 Purslane is widely used as a salad plant and is also cooked like spinach in the Far East. An excellent source of vitamin C, iron, magnesium and potassium. The juice stimulates the appetite and has an antiseptic effect in the intestinal tract. It is good for liver and gall bladder problems, is a blood cleanser and soothes the mucous membranes. Use the green stems as well in juicing: they are very high in minerals as well as vitamins A (beta-carotene) and C. Used only a small handful at a time and mix well with other vegetable juices. A thick tuberous rhizome which the Romans used for medicinal purposes. A juiced 1.5-2.5 cm/%3 in piece of the root gives a delicious zip to many fruit and vegetable cocktails. It is a good treatment for fever and has been recommended as an aid in healing vocal chords and as an expectorant to rid the sinus cavities of mucus and the lungs of phlegm. Spinach juice has a very important role to play in building the blood and revitalising the constitution. The juice is an excellent source of chlorophyll and a good source of vitamins A, B-complex and E, calcium, iron, magnesium, phosphorous, potassium, sodium and trace elements. It is rich in oxalic acid. It is said to have more protein than any other leafy vegetable, apart from seaweed. The juice strengthens the teeth and gums and has a mild laxative effect. 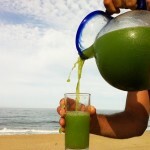 Spinach juice is best used in moderation (i.e. 30 ml/ 2 tbsp) mixed with a combination of other vegetables, preferably carrot, only once or twice a week. Acne, anaemia, anxiety, arthritis, asthma, cancer, circulatory weakness, colitis, constipation, cystitis, depression, diabetes, diarrhoea, digestive weakness, eczema, eye disorders, fatigue, gout, haemorrhoids, hair loss, halitosis, heart problems, high blood pressure, infection, kidney disorders, laryngitis, liver disorders, menopause, motion sickness, mouth ulcers, muscular problems, nausea, nervous disorders, prostate disorders, pyorrhoea, skin disorders, stress, thrush, thyroid irregularity, ulcers, varicose veins, weight loss. These are the first spring greens of a cabbage that grow before a head is formed, and they are good for juicing. Raw cabbage is an excellent source of vitamin C and folate. It also contains some beta-carotene, depending on the amount of chlorophyll, and the outer leaves may contain 50 times as much as the inner white leaves. Related to sugar beet and first grown in Sicily. It is grown for its green leaves, not the root, which taste like spinach. It is a good source of iron and pro-vitamin A and vitamin C. It must be mixed with other juices. Anaemia, anxiety, asthma, bronchitis, cancer, fatigue, menopause, menstrual problems, muscular problems, skin disorders, thrush. Tomatoes, sometimes known as love apples, are classed as a fruit, and they provide an excellent amount of vitamins A, C and E. They are a good source of potassium and there are trace elements of iron and iodine. Fresh, ripe home¬grown tomatoes are best for juicing, and a mixture of carrot, spinach and tomato juices is very good for anaemic conditions – a popular way to serve it to children, who may need extra iron. 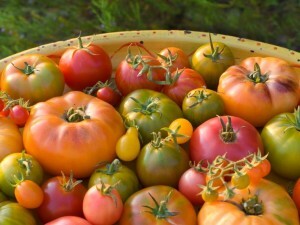 Fresh tomato juice is said to be highly cleansing to the liver, and good for digestive upsets. Anaemia, bladder disorders, digestive weakness, gout, kidney disorders, liver disorders, menopause, skin disorders, weight loss. Turnip greens contain a massive amount of calcium, iron and vitamin A (beta-carotene), so chop them for juicing with the root, which contains potassium, calcium, phosphorous, magnesium, sulphur, copper, and vitamins A, B-complex and C. Turnip juice is said to make a good pick-me-up when you’re run down or depressed. Some have reported it as being good for kidney stones. Acne, anaemia, arthritis, asthma, bladder disorders, bronchitis, cancer, circulatory weakness, diabetes, eye disorders, fatigue, hemorrhoids, heart disease, infection, kidney disorders, liver disorders, lung disorders, motion sickness, nausea, skin disorders, thrush, varicose veins, weight loss. Watercress is abundant in minerals, especially iron and calcium, and is an excellent source of vitamins A and C. It has great restorative powers as a purifier and strengthener of the blood, and holds a very special place in raw juice therapy. It also contains gluconasturtin, which when chewed, chopped or juiced neutralise’s a carcinogen in tobacco. The juice is too strong to be taken neat, but its pleasant peppery flavour mixes well with carrot and other vegetable juices. Combined with cucumber and beetroot (red beet) juices it is said to remove the uric acid in some forms of rheumatism. Mixed with carrot, parsley and potato juices, it is believed to be helpful in clearing the lungs. Respiratory and urinary tract infections are said to benefit from doses of watercress juice. Wheat grass is commonly used in the United States. It is an excellent source of chlorophyll and is said to have the widest range of vitamins and minerals of any of the vegetables. It is believed to have remarkable regenerative and anti-aging properties, and is highly recommended in America for cancer patients. Research by the English nutritionist Jackie Norton confirms that, because of its high level of antioxidant enzymes, wheat grass can help to alleviate toxic conditions. It can be grown at home on trays. Acne, anaemia, anxiety, arthritis, asthma, bladder disorders, bone disorders, bronchitis, cancer, circulatory weakness, colitis, constipation, cystitis, diabetes, eye disorders, fatigue, hair loss, hay fever, heart disease, high blood pressure, hypoglycemia, impotence, infection, kidney disorders, liver disorders, low blood pressure, mouth ulcers, nervous disorders, premature aging, skin disorders, stress, ulcers, weight loss. This is why we are passionate about vegetable juicing as it is so incredibly healthy and can heal and alleviate so many health conditions. Yes, it takes a little time but it also took a long time to get to an unhealthy state,and you will be amazed at how quickly your body can respond to these power packed energy shots! !